“We come from the land of the ice and snow, From the midnight sun where the hot springs flow.” – A passage written by a traveling skald companion accompanying a communion of frost clerics. Elemental Powers circle throughout known reality. Heat can transform into fire or lightning, gusts of wind can carry even the mightiest of rock and the water itself can become a solid sheet of ice. In a sense, a rival to the Tempest Cleric, the Ice cleric is at home in the realms of bone chilling temperature, the stinging sensations of ice and the comfort of powdery snow. For them, the cold isn’t just the absence of warmth, but a holy communion among frigid elements; a raw and unforgiving form of nature. Like the northern air, a frost cleric can travel gently like a light flurry or bombard foes like the harshest of blizzards. Many Ice Clerics accompany hunters or are hunters themselves. Through their devotions, they can trap creatures through sheets of ice, hollow snowy holes or other wintry tricks. Like the ice cold, many of these clerics tend to be rigid and devoid of emotion and often passion too. To some, it’s as if the cold has influenced their own convictions and values as well. As such, neutral alignments tend to be the most common among their orders. Likewise, neutral elemental gods of ice empower such clerics. That isn’t to say that beings like Auril don’t use such power for evil though. Many dress modestly, bundling up at almost all times. In warmer regions, many of these priests might quickly feel out of place. The idea of shedding layers is foreign, outside of bathing. Author’s Note: There are plenty of elemental niches covered in the cleric, but a cold one is lacking. So, let’s tackle that! Also, I found my set of Reign of Winter books for Pathfinder. So, there’s a big inspiration. It looks like someone channeled the same idea as me several months beforehand. Well, this is an awkward coincidence. But, I assure you that this is literally the first instance of seeing another homebrewed take via D&D Beyond or the like, as I don’t go there for homebrew. None the less, here is the version I stumbled upon a couple hours before posting this. But, how much can you do with an ice theme, I guess? Well, I may as well not name this Frost Domain anymore. On to something more generic, I guess! The art of the shootist has transcended beyond certain types of warriors and scoundrels, expanding to even holy warriors, devoted protectors of spiritual ways or even magic-users themselves! Author’s Note: I meant to do this long ago! However, monsters took over much of my gaslamp/weird western thing. So, let’s not delay this any longer! Here are more ranged (guns) sub-class options for your games! Also, this time an homage to The Dark Tower. Also, special thanks to my friend, Ian. Your insight really helped shape things here, and your endurance allowed you to deal with my endless rambling. Trying to hammer sub-classses based off a meta concept like ranged weapon combat proved to be a challenge for me… especially in regards to classes that weren’t quite meant for them. As such, this might be a little more janky than some of my other creations. I’ll try to refine whatever I can here. The concept of death inspires some of the oldest fears known to civilization. The end of life, the end of all we have worked for. The finality to our existence. While many fear death, the idea of undeath proves to be far more horrifying to many. The idea of losing ones self, the very essence, coming a shriveled shell that exists as a mockery of its former self. These are the fears of the undead. For that reason and more, they are a menace to civilization on the average. Why are the undead are considered a menace to the living? For a variety of reasons, of course. Many of these reasons derive from ethics over necromancy, while others are because of their often destructive ways. None embody the latter more than a secretive cabal known simply as “the entropic gloom”. 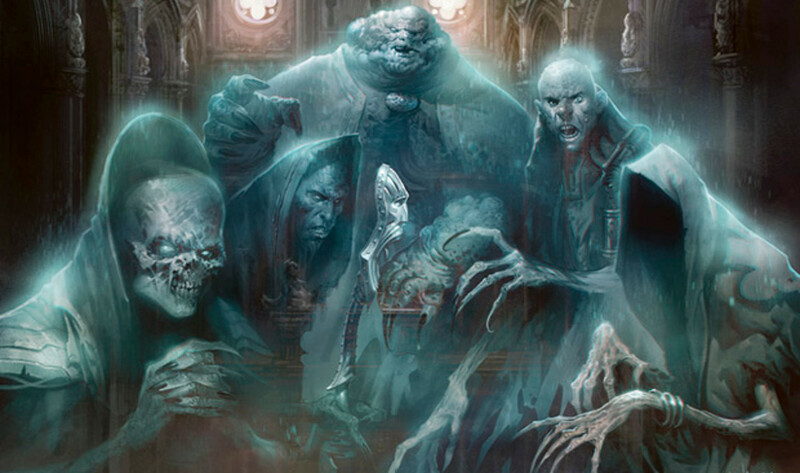 This quasi-religious order is dedicated to eradication of the living, assimilating them into the ranks of the dead. The reasons for this? Cloaked in shadow, much like themselves. It could be out of contempt for the living, some utopian ideal of unity or perhaps even a penchant for heinous acts of violence. While much of the ranks of this cult are typical undead, some have been transformed into truly incredible servants of dread forces. Author’s Note: I loving making undead nasty nasties! This is no surprise, for those who know me well enough… So with that, here’s an assortment of living dead monsters to torture your players with. After reading up on monstrous synergy via Tome of Foes, I’ve plucked a few ideas to boot! Also, priest characters, you’re gonna have a bad day. For anyone supporting my second tier, you can check out this live draft on Patreon, where it shall receive some upgrades and downgrades. Your devotion extends far beyond Gods and Ideals, but shaping technology and other crafts of artifice to set your needs and goals. To you, crafters of traditional magicks are below you and a detriment to the inevitable advancement of civilization. All aspects of experimentation and engineering are at your mercy. You don’t just have faith in super-science, you control it! In terms of domains and belief, this domain is more than capable of existing in numerous settings. In the case of Greyhawk, Myrlund the Cowboy hero might be a good match for heroes interested in weird western steampunk elements. For the Forgotten Realms, one of the Gnomish deities or Gond Wonderbringer would be a perfect match. Likewise, anything (Tinker) Gnome is perfect in the Dragonlance setting. Of course, the Iron Gods themselves would work within Pathfinder’s Golarion. Author’s note: This domain is heavily inspired by the Technocracy faction in the Original/Classic World of Darkness campaign, “Mage the Ascension”, not to mention the Iron Gods Adventure Path for the Pathfinder Roleplaying Game (available now!). Of course Blackmoor, Eberron, and Iron Kingdoms had something to do with this.